The e-mail came across my screen innocently enough. A former boss, Dinda, whom I hadn't heard from in some time, was sending me pictures through some social-networking outlet called "Tagged." Interesting. Did Dinda and I snap a photo together back in the day? I didn't think so, but I often forget if I've washed my hair two minutes after rinsing the shampoo. How could I be sure she wasn't sending me a poignant shot from four years ago? Plus, who doesn't like looking at their younger, better-looking selves? Or maybe Dinda wanted to update me on her family. Who knows? In any case, I was intrigued. The message said that "Dinda sent you photos on Tagged." Below that message was a link. Under the link it said, "Click Yes if you want to see Dinda's photos, otherwise click No. But you have to click!" Funny, there were no "Yes" or "No" tabs in the e-mail. Below that message it said, "Please respond or Dinda may think you said no :(" The sad face is a strong guilt trip. So I clicked on the link  a disastrous decision. I'm not going to retrace the exact steps, because to do that, I would have to click on that link again, and I'm deathly afraid of it. Basically, as I remember, I registered for the site through a Windows Live hotmail address, and very early on in the process it asked if I would like to send along a similar message to every contact in my account. Now, why would any sane person want to invite every person in their contact list to look at photos they hadn't even uploaded? Contact lists are diverse  friends, family, professional acquaintances, people you haven't spoken to in five years. I have 227 people in there, some who probably don't know who I am. No need to shoot them beach pics. I thought I declined that absurd request, but somewhere along the line I remember clicking Yes, thinking it was part of the registration process. At no time did I intentionally click on anything that gave Tagged the right to spam my contacts. Still, unbeknownst to me, a message with the subject line "Sean sent you photos on Tagged :)" went out to every single address on my list. Again, I never put photos on Tagged. And I don't have a "smiley-face"-style relationship with most of my old professors. Meanwhile, in my quest to see Dinda's pictures, the site asked me to upload a headshot. Sure, no biggie. Then it started asking for my cell-phone number and making all these ridiculous offers for sweepstakes and other stuff no one should want. I'd skip an offer; another would come up. It was all junk. That's when I realized this was shady. I finally got to Dinda's page  no pictures at all. I shut it down, but it was too late. The calls, text messages and e-mails came pouring in. "Did you send pictures?" "What is this Tagged stuff?" "Thanks for the headshot, jackass." I had to send out a bunch of apologies and explain what the heck was going on. I didn't want to disturb anyone else's afternoon, but I probably did. I was had, 100%. I'm not alone. Over the next few days, I heard a dozen or so complaints from people that Tagged had spammed their entire contact list. One quick sweep of the blogosphere reveals a multitude of Tagged victims, dating back to 2007. But the scam is red-hot now. "Don't Get Tagged!" one blogger warned on June 6. "Spread the word: Tagged stinks!" shouted a Facebook friend the same day. The Better Business Bureau's grade for Tagged: a big fat F. Yes, I blame myself for being gullible. But the site was confusing and dishonest. And it's nice to know I'm not the only sucker out there. So what is Tagged? The company calls itself a "premier social-networking destination focused on 'Social Discovery,' " whatever that means. 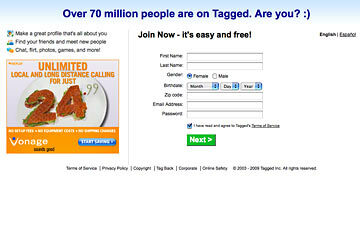 It claims to have 70 million registered users worldwide, though I'd imagine some of them are accidental like me. Believe it or not, Tagged is the third largest social network in the U.S., with over 70 million monthly visits, according to comScore. Impressive  but again, I'd like to know how many of those visits were intentional, not the result of spam. Two Harvard math majors, Greg Tseng and Johann Schleier-Smith, co-founded Tagged in 2004. I called them up, wanting to know why they're using Harvard math degrees to annoy the piss out of people. Tseng, the CEO, was unavailable, but Schleier-Smith, the chief technology officer, agreed to talk, but only over e-mail. "We did not intend to cause people to invite contacts by accident," Schleier-Smith wrote. "The recent backlash hurts, and we want to ensure our continued growth helps people rather than creating problems for them." So what exactly happened? "Recently, we integrated the 'Tags' photo-sharing feature with the registration path," Schleier-Smith wrote. "Advertising photo-sharing may be causing some users to rush through the path, and in some cases inviting all of their contacts inadvertently. The pop-up warning that prevented accidental invitations in the past is not sufficient anymore." Schleier-Smith insists Tagged is trying to control the damage. "At the moment, all invitation e-mails are stopped while we change the product to prevent confusion," he says. If the mix-up was really a mistake, give Tagged credit for apologizing. But I've been burned, so here's my advice: If you get any kind of message from Tagged, delete it. Avoid the site altogether. If you want "social discovery," sites like Facebook, Twitter and MySpace work perfectly fine. And whatever you do, stay away from the headshots.